Recipe | Coconut Cake with Dulce De Luche & Peanut Praline. Sure, the classic Woolies mud cake isn’t going out of style anytime soon, but what about the amateur Cake Boss who wants to test their baking skills and blow people’s minds with an epic cake creation of their own? Well look no further, one of the most exciting pastry chefs in the game has given us the tools to do just that! 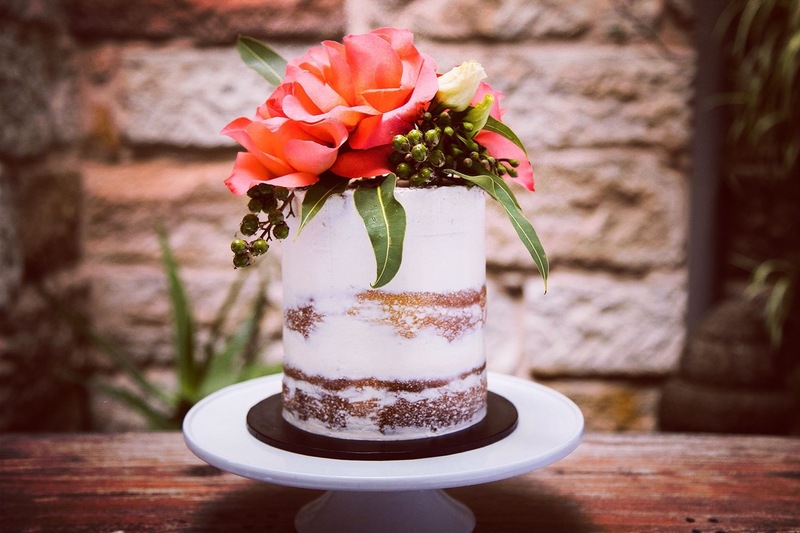 This Coconut Cake with Dulce De Luche and Peanut Praline is a work of art from the mind (and kitchen) of Stacy Brewer Cakes, a one-of-a-kind creator known for her bold colours and signature floral-inspired designs that are absolutely bursting with mouth-watering flavour. 1 can of Dulce de Luche. 1 Preheat oven to 160 degrees Celsius. 2 Line 3x round, 6-inch baking tins. 3 Into a bowl, place butter, sugar and, with either a kitchen aid or hand mixer, beat until pale and fluffy. 4 Add eggs one at a time until well combined, making sure to scrape down the sides of the bowl. 5 Mix dry ingredients together in a bowl and then add half the dry mix and milk. Scrape down the sides and then add the remaining dry mix and milk until well combined. 6 Pour mix evenly into the three cake tins, and bake for 40 minutes (depending on your oven). 7 Test with a skewer after 40 minutes, to check it comes out clean. 8 Wait until cakes are cooled and then turn upside down to remove from tins. Place in the fridge. 1 In the top bowl of a double boiler, combine egg whites and sugar. Whisk constantly with hand whisk over simmering water, until all sugar is dissolved and no crystals are left. 3 Switch to medium speed and add cold butter, one piece at a time, scraping down the bowl each time. Add vanilla, beat until combined. Place peanuts onto a lined baking paper tray. In a small saucepan, place the caster sugar followed by the water. Make it a slurry so that the sugar is combined with the water. Place onto the stove on medium. Continue to boil until the caramel turns golden. Pour over the peanuts on the tray. Let cool. With the end of the rolling pin, smash up into pieces. 1 Make sure all cakes have been in the fridge. 2 Remove cakes and place them on the bench, they will need to be levelled out to remove any raised areas, with a serrated knife. 3 Your 3 cakes are all the same and are now ready to be assembled. 4 Place your Swiss buttercream into a piping bag with a large round nozzle. 5 Place cake number one onto a cake board and starting in the center of the cake pipe around in a continuous circle until you get to the edge. 6 Open the can of Dulce de Luche, and scoop teaspoon size pieces of caramel into the buttercream. Approximately 6 spoons. 7 Sprinkle a layer of peanut praline over the buttercream. 8 Place second cake on top, making sure to push down gently to create even edge. 9 Repeat the piping process on this cake, with the buttercream, caramel and peanut praline. 10 Place cake number three on top and push down to even. 11 Refrigerate the cake for 30 minutes. 12 Remove cake from fridge; it is now time to do the final coat. 13 With a palate knife, start on the outside edges; you can use a decent amount of buttercream. 14 Now that you have covered the sides, use your palate knife in one continuous motion to scrap off the unwanted buttercream until smooth. Now on the top, use your palate knife to lightly cover the top edge with buttercream. You may need to go back and do the sides again. 15 Remove your cake with a palate knife onto a display board/plate and decorate with seasonal florals.